re: New leather wrap for my Honda Jazz's steering! WOW!! This is great levels of craftsmanship. Thoroughly impressed with the way the wrap has been fitted. Could someone suggest any place in Chennai who can do similar work? I would like do have my grand i10's steering wheel leather wrapped. Thanks in advance. Please confirm whether the battery was removed before removal of the steering wheel. Coz AFAIK, in a car with airbags the battery MUST be disconnected before removal of the airbag. The airbag is very much like a very small bomb. Also the bumps(circled in red) could have been avoided if the leather had been skived before stitching. Firstly, I must thank you for finding this guy. This is a genuine issue for those who use their vehicles for long periods esp. in North India. Please do share the location, mobile number and other details. I am completely adverse to the regular PU/art leather covers you get in the market for 200-500-700 bucks. They don't fit properly, ruin the tactile feel and worst of all, look ridiculous. I wanted a proper leather wrap which had to look as close to factory-fit as possible. Even I absolutely hate the add on covers that you get for steering wheels. The leather guys seem to have done a great job on your car. Looks right out of the factory. OT: A funny thing I have seen is people who use the PU covers over the factory leather wrap. Brilliant Detailed Pics. That is some very neat work. Will surely get it done on all my rides in the coming days. Can you please list his number & exact location / directions? I'll add it to the opening post and make this an entry in the Team-BHP Directory. Will surely help others. It is already there in the directory. After almost 80,000km of use,the steering wheel of my Jazz was showing obvious signs of wear and tear. Discolored patches had developed on it and were an eyesore on an otherwise impeccably maintained car. I checked with the stock leather wrap of the City VX at the showroom when the car went for service. This has just as good overall fit and finish and is actually better in terms of material quality and feel in the hand. Good to see! My steering will be due for a second round of refurbishment soon. I've done 25K kms so far, I think I'll manage to get another 5 or 7K before it starts looking worn out. How long did he take, and how much did it end up costing you?Also, are you aware if they do the rest of the car as well? Yes, it is them. 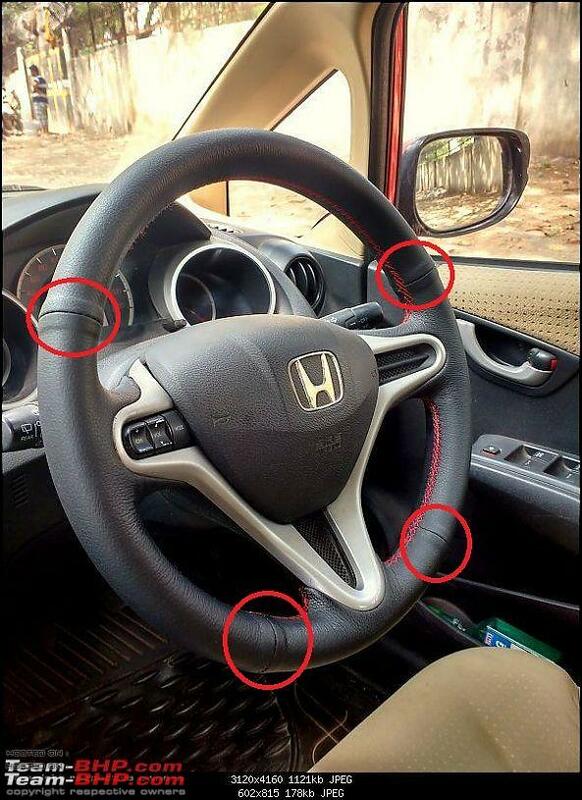 They do the entire interior of any car. As you must've seen in my thread, they've worked on my W124s too. Last edited by Viraat13 : 2nd May 2016 at 14:36. The fit & finish has come out perfect. This job requires SKILL & if done well the results show, like in your case. My only worry is that though this can be done easily for cars with black or beige interiors as its not hard to find a matching colour leather. I have got it done on my Altis and Fortuner steering, color match is 90% accurate. The fortuner color is more dark beige than grey. Got it done from Shanbaug in Dadar who further outsourced it to a guy in the area. Costed nearly 3k but perfect job. Nice job! Steering looks cool and chunky now. Is it advisable to get this done for a car under warranty? Removal of steering wheel will result in warranty getting void. Can it be done without getting the steering wheel removed? The steering wheel looks really good. It's the money well spent. I don't think there will be any problems with your warranty to put on a steering wheel cover. It is possible to put the cover without removing the cover. That's amazing work and we also have someone like this in my city. But like someone said here, the airbag is like a small bomb...I'm never confident to give it to a local guy who might set it off and then replacing it is gonna cost a bigger bomb! I might be wrong but still. Great fit and finish! 2000/- bucks is a great deal, considering genuine leather and the amount of work. I would like the steering wheel of my swift leather wrapped as well, as I believe leather grips better than soft plastic (or whatever the non-leather wrapped steering wheels are made of), especially during the monsoons, when a/c makes the palms dry. However, I am skeptical about getting the airbag module removed. Is it safe to do so? 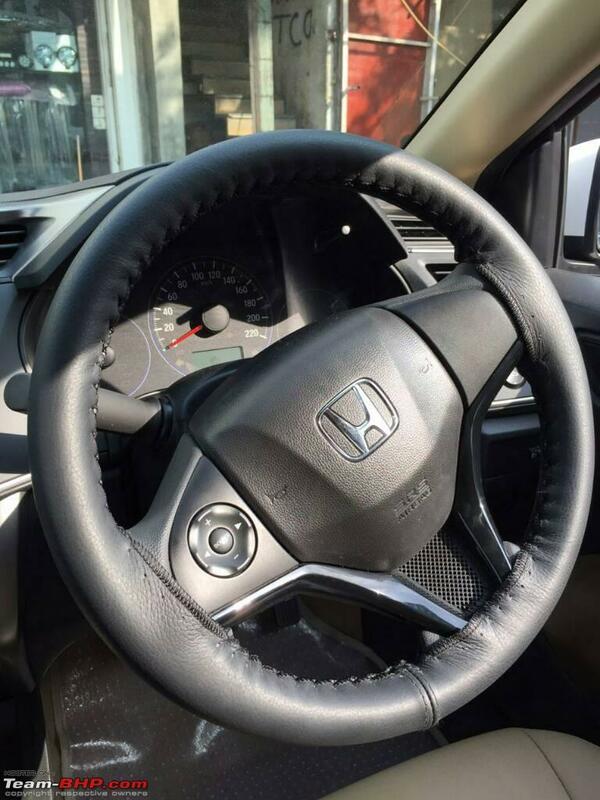 I also got my Honda City steering wheel leather wrapped few months ago. I chose a branded product from Hide Nation. I did not remove the steering wheel, in fact I would not even consider it on a new car. The leather wrap has been stitched on as shown in the photo and it gives a perfect fit, no issue whatsoever. Price around 800 inclusive of fitting. Note it was not done by the guy in the post title but I don't know why Shreyans post has been moved here, mods please look into it. It is recommended not to remove the steering wheel, if there is air bag involved . Karlsson's never ever remove the Steering Wheel if air bags are there! The airbag is a plug and play module which as you can see in the pictures is connected to the system via a connector. I don't see any issue in removing it by unplugging it. You are very correct. They had disconnect the battery before removing the airbag. I had completely forgotten to mention that! I'll edit the post accordingly. I dont have his number, but now that this thread has been merged, you'll find his number in the opening post. As it turns out, this guy is quite popular among BHPians! Google Maps will guide you to Palika Bhavan, where you'll have to ask around for this person. Its a small place, you will not find it difficult. These people had a variety of color options to choose from. When they were doing my car's steering, a CRV arrived with a torn door-pad armrest. They found a good enough match and replaced the leather. I see no reason for this to lead to any complications with the warranty. The steering is easily detachable. The airbag was removed via the dedicated connector. No electrical or mechanic components were altered in any way. You simply cannot get this kind of finish without removing the steering. At best, you'll get the kind of results like what someone has posted just a couple of posts before this one. See for yourself and decide if you'll be satisfied with it. This steering is also made of soft plastic. Leather provides much better feel and grip. As I've mentioned in previous replies, there is no issue with removing the airbag as long as it is done properly via the dedicated connector after disconnecting the battery. This looks so much better than the stock steering. Thanks for sharing this. I too have a Jazz that's around 5 years old with around 25k kms on the odo. Steering is starting to show some ageing. And for 2000INR, this is a steal. Do they have artificial leather as well? I am personally not inclined towards leather of any sort. Also, i have the JazzX that came with blue black interiors and i wanted to enjoy the feel of the fabric on the new car and hence didn't opt for seat covers at the time of purchase. I think now is the right time, but i need fabric seat covers, preferably in blue black . Any pointers?